If you’re like most business owners that want to learn how to win government contracts or win small business contracts, you have probably already spoken to several non-profits in your local region who are funded to help small businesses win small business contracts. You’ve also probably already attended a handful of conferences and expos, paid for a couple of webinars, or purchased a dozen government books on how to win government contracts. Yet, a very large number of companies have yet to crack the code on how to win government contracts and increase their sales. 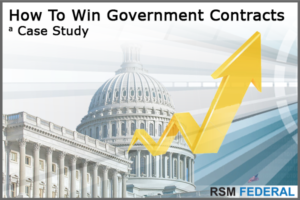 Last year, RSM Federal started working with a company that wanted to learn how to win government contracts. If you’ve visited www.rsmfederal.com, you’ve seen hundreds of testimonials and this is from one of them. However, we don’t want to impact their competitive position in the market. So for the purpose of this article, we’ll simply call this company Axim Technologies. Axim is small business and SBA 8a Certified with eight employees. When we first started working with Axim Technologies, they were focused on commercial sales. They had a basic understanding of how to sell to the government but with little success. They spent a year working with various counselors but did not win any contracts. Two-day onsite Master Series Government Workshop tailored specifically to their company and the services they provide. Many coaching and consulting firms provide workshops on how to win government contracts. Researched and identified which government agencies buy what they sell, how much they buy, and how often they buy it. An overview of these tools is outlined in the article Government contract data – where to search. Provided all templates, tools, and step-by-step strategies via the Federal Access platform. Anyone that has targeted the government for three months has been told, “You need a capability statement.” It’s simply a one page marketing slick. What’s unfortunate is that most counselors and consultants treat the capability statement as a critical sales tool. It’s not. It’s important but your focus is not the products or services you sell. It’s communicating the value your solutions provide to your clients. You’ll notice that a capability statement is not specifically listed in the bullets above. Yes, we helped them with their capability statement but the capability statement is a byproduct of the other activities. RSM Federal runs a platform called Federal Access. It has more than half a dozen templates for your capability statement. Don’t pay a consultant hundreds of dollars to do it for you. All of the above activities included dozens of sub-activities but that’s not the focus of today’s article. What’s important are the results and how the integration of the above activities were designed to achieve success. First we’ll outline the results and then we’ll discuss how the integration of these activities opened new doors and provided competitive advantage. Built a government sales strategy based on who buys their solutions, how often they buy, and how much they spend. A government sales strategy that included a list of companies with prior government contracts for teaming. How to price and differentiate their proposals. Developed a prospecting plan that focused on pre-acquisition (before RFPs or RFQs are released). Developed new messaging to communicate expertise in the federal market and their industry that provided a solid perception of maturity, expertise, and trust. In the first eight months they exceeded their annual quota by 43%. Awarded two contracts with the Department of Veterans Affairs, their largest federal contracts to date. Awarded a contract with the Department of Defense. Joined a team that was awarded a $5 Billion government wide acquisition contract (GWAC). In little more than six months after initiating their sales strategies, how did Axim Technologies win these these large and small business contracts? Axim Technologies did not simply go to their local small business counselor to learn “how to sell” to the government to win small business contracts. They stopped responding to every RFP or RFQ they saw on FedBizOpps and did not overly rely on the emails they received every morning from their bid-matching system. These are the reasons why so many companies fail to successfully win small business contracts. Yet, this is exactly what most companies are told to do. Unlike most companies, Axim Technologies focused on the strategies, not bid-matching systems or capability statements, to win government contracts. If it were as simple as meeting with a small business counselor or searching Google, everyone would successfully win government contracts. Successful companies immerse themselves in understanding the market and picking the right strategies to differentiate and communicate competitive advantage. What Axim Technologies learned in the workshop was streamlined and built into their business development activities. Axim Technologies’ value and the strategies they utilized were integrated across their public-facing tools and platforms. This only took two months to implement. Before Axim Technologies took these steps, the president of the company set a sales quota of $300,000 for government sales. It was RSM Federal’s responsibility to help them get there. Government sales was still a new concept. In the first eight months, they won $430,000 in government contracts. While other companies sell what they sell, the approach to how they differentiated and communicated their value was more important. It’s more than simply creating a government capability statement, updating your website, having a government landing page, or writing proposals. Success is based on how you communicate the value that your products or services provide. Three months ago, the Department of Veterans Affairs reached out to Axim about two small business contracts. We strategized on how to position and win these opportunities. Although the incumbent had performed outstanding work, the acquisition strategy did not allow the incumbent to compete for the follow-on contracts. We called the incumbent (who was less than thrilled to hear from us). However, we developed a strategy that proved to be successful and mutually beneficial. When Axim Technologies negotiated with the incumbent, they provided a win-win solution. Axim Technologies was willing to give-up revenue that most companies would never consider. However, it guaranteed an exclusive teaming agreement. The competition lost access to the incumbent. Axim won both small business contracts. In this case, it’s less about what you sell and more about how you position with the government and with your teaming partners. How did the government contracting officer know to call Axim Technologies? Axim had been talking to the government for the past three months as part of their sales strategy. Then something happened that became the genesis for today’s article. An incumbent NASA SEWP contractor, one of only 45 primes on the contract, reached out to Axim. SEWP was being recompeted. There was a requirement in the RFP that was new and the prime needed to add a new subcontractor to the team. Why did they contact Axim Technologies? Because Axim’s website communicated a mature understanding of the federal market. That was the start. That same day, a conference call was scheduled and the very first question Axim asked was “Are you formally asking us to be a sub-contractor on SEWP?” They said yes. Within 24 hours, the two companies signed a teaming agreement for one of the largest GWACs in the government market. Their website and how it differentiated Axim’s value was critical. It’s more than simply what you sell. It’s how you position. You need to communicate actual and perceived maturity as an organization. The team that Axim joined won the contract and is now competing on task orders. Why did the prime contractor look at Axim’s website? They were doing due diligence on potential teaming partners because Axim had already reached out to them. It was part of their teaming strategy. That’s how you win government contracts. It’s less about what you sell and more about how you position with the government and your teaming partners. The basics of selling to the government are provided by several dozen organizations, many of which are free services. They all provide solid value. Selling to the government and giving yourself a higher than average chance for success requires more than a basic understanding. Education is a common business paradigm regardless of market or industry. It requires immersion and utilization of proven techniques and strategies. These include prospecting and sales, marketing, teaming, proposal development, and back-office operations. If you want to see all the templates and sales strategies that Axim tailored for their business, you’ll want to check out Federal Access. It starts with the owner. It comes down to business acumen. If you become a student of government sales, you’re likelihood of learning how to win government contracts will be much higher. When you wonder how a specific company became successful. . . now you know. If you have any questions, don’t hesitate to talk to us.